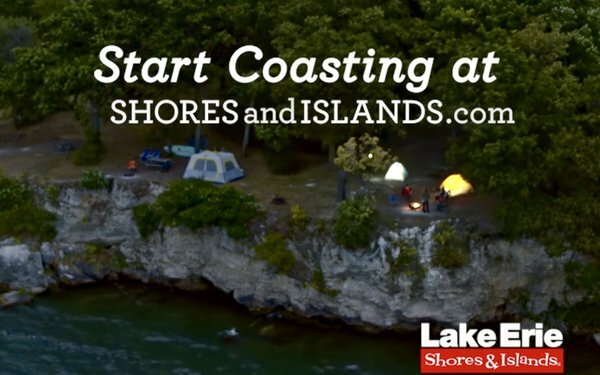 For the first time, Lake Erie Shores and Islands is using a digital-only, highly targeted campaign approach to promote tourism to the vacation region instead of the traditional focus on broadcast TV and outdoor advertising. Developed with AOR Marcus Thomas, the "Start Coasting" creative opens with a singular close-up image of a particular scene, such as a couple atop at lighthouse, before drone footage expands to provide a bird's-eye view of the broader region. View some more of the work here and here. The ads will run across connected TV, pre-roll, digital display, rich media display and social channels and specifically target friends, couples and families. Through retargeting, audiences throughout Cleveland, Columbus, Detroit, Cincinnati and Toledo will see more ads featuring additional relevant experiences and lodging options to help them plan and book their stay. In addition to the spots, which launched in April in advance of the peak travel season, an influencer marketing strategy will become part of the campaign in June.